The Environmental Working Group is an non-profit organization that researches and reports about the toxicity of our food, water, cosmetics, cleaning products etc..
To protect the most vulnerable segments of the human population children, babies, and infants in the womb from health problems attributed to a wide array of toxic contaminants. I highly recommend you take a look at their DIRTY DOZEN list of the most pesticide laden foods. 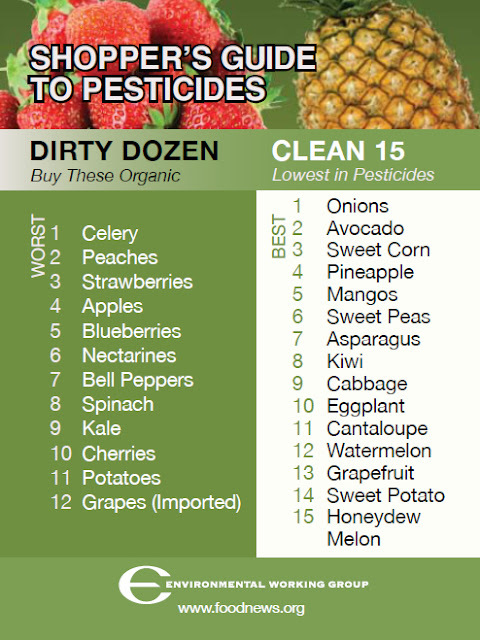 Even if you don’t want to buy everything organic at least buying organic the fruits and vegetables that are listed as the most heavily sprayed, will save you and your family from ingesting the most highly toxic food items. Thanks for sharing this, Diane. EWG does such great work. I think it's worth noting though, that while corn is on the list for "Cleanest," it's often GMO. Buying organic, ensures one is avoiding the pesticides but also the genetically modified versions. Good point I was just reading about how up ward of 85% of nonorganic crops are GMO... and of course products are not labelled. I'm hoping to start buying at the farmers market! I don't know if ours has started yet though, I should look into that. Your post really helpful for my Pesticides Market Research and development. Glad this is of help to you. Thanks for visiting.